They are found in Canada, west of Hudson Bay from Northern Manitoba through the Northwest Territories and above, sometimes migrating south in the winter with the caribou herds. Hudson Bay Wolves are of medium size with body lengths of 4 to 5 feet on average, and measuring from 28 to 36 inches high. 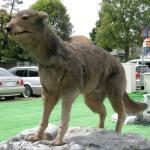 Their weight may vary anywhere from 80 to 140 pounds, with females being slightly smaller than males. They have bushy hair that can vary from a light grey to a yellowish-white or cream color. Their hair seems to be lighter in the winter. 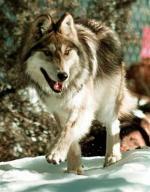 They are said to be similar in general to the Mackenzie Valley wolf, only smaller. Hunting in packs, they will prey on large ungulates such as caribou, moose and bison. When large prey is not as plentiful, they will also feed on carrion and smaller animals. On average, they require about 10 pounds of meat per day. Mating usually occurs in the spring between the alpha pair of the pack. Gestation lasts 62 to 65 days, after which the mother gives birth to an average of 4 to 6 pups. They are brown in color and deaf and blind for the first 10 days. After several weeks, they begin to leave the den, but are still breastfed for 2 to 3 months. 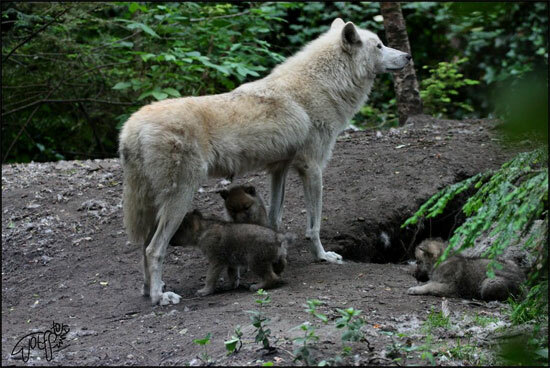 All members of the pack participate in raising the young. They reach full maturity by 2 years. 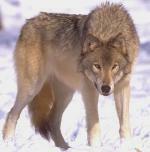 The status of the Hudson Bay Wolf has not been evaluated by the IUCN. Though it is considered by many to be endangered. Its lifespan in the wild is approximately 10 years.